Blackcurrants are very easy to grow. They fruit well even in shade and pretty much the only care they need is relatively straightforward annual pruning. Deer are not particularly fond of the bushes and birds are not fond of the fruits. Ever since I started growing berries, blackcurrants have been among my favorites. 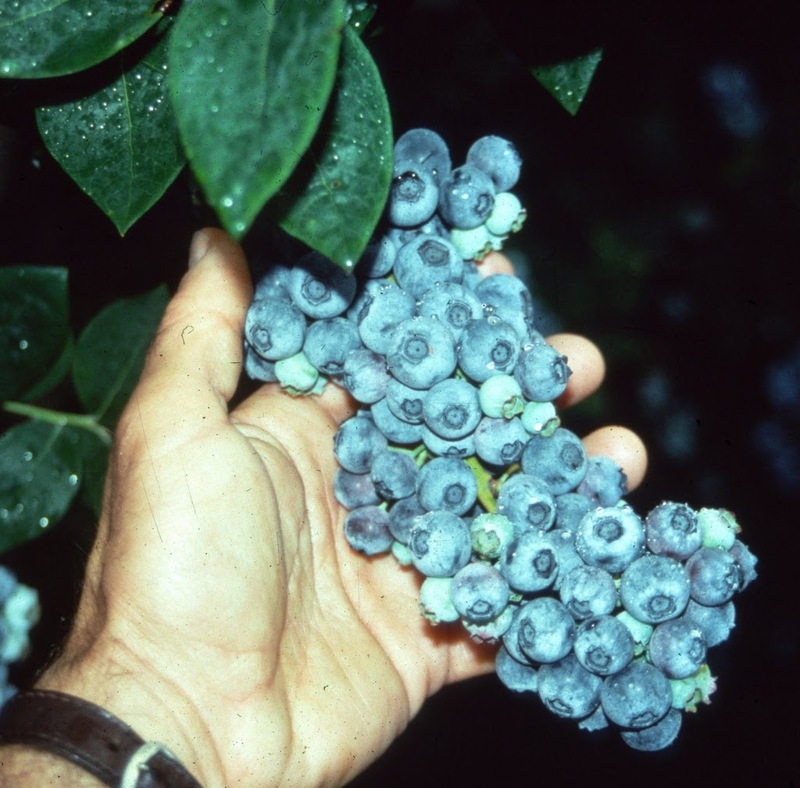 These berries are generally unknown in this country because they can host a disease of white pines, a valuable timber crop, so were banned until recently, when disease-resistant varieties where developed. Consort is one such variety, which I liked fine, but a few years ago I got my hands on some Russian varieties, which are disease resistant and have much finer flavor. Eating fruits of the varieties Kirovchanka, Belaruskaja, and Minaj Shmyrev moved blackcurrant up the scale to my favorite fruits, along with blueberries. “What about strawberries?” you might ask. They’ve been ripe for weeks now. They’re berries also. I like strawberries but they are not among my favorite fruits. I don’t like crawling on the ground to harvest fruits, and, although strawberries are technically perennial plants, a bed starts to decline after 5 years or so due to encroachment of weeds and diseases. Even before that 5-year mark, a bed needs annual renovation if it’s going to remain healthy and productive. Take a look at my strawberry bed today and you’d think that I didn’t like the fruits at all. I renovated the bed, something that looks brutal and is needed every year soon after the harvest is over. Step one is to go through the bed and thin out the plants so that each has almost a square foot of space all to itself, with preference given to younger plants. Two rows of plants run the length of each 3-foot-wide bed. While thinning plants is also an opportune time for thorough weeding and pulling off runners. Next, I used grass shears to shear all leaves from all the plants, then gathered up all the cut leaves to cart off to the compost pile. This step lessens disease buildup. And finally, the bed got blanketed with an inch-thick icing of compost or, alternatively, some organic mulch such as straw, pine needles, or wood shavings along with a bit of fertilizer. This mulch feeds the soil, enriches it with humus, conserves soil moisture (not needed this year! – yet), and keeps roots cool. There are other ways to manage a strawberry bed but the system described, called the “hill system,” works well in intensive, closely managed gardens. No matter what growing system is used, though, any strawberry bed needs weeding, thinning, periodic rejuvenation, and eventual replanting. We can’t forget about vegetables in our (very) local harvest backyard harvesting. Looking ahead to autumn, I sowed seeds of endive and radicchio along with more broccoli and cabbage, recently sown seedlings of which got flattened during a recent deluge. I also sowed my biweekly pinch of lettuce seeds to keep us in big salads right through summer. Once up, all these seedlings can grow in self-watering APS seed flats (from Gardener’s Supply Company) for about a month before being planted out in the garden. Then there will be space available from which peas and early beans and corn have been harvested and cleared away. Later, harvested onions will free up more space. Looking ahead to two springs hence, small spears are now appearing in the flat in which I sowed asparagus seed a couple of weeks ago. They’re so cute; they look like miniature asparagii. I planted a bunch of beds with strawberries last spring, and I’m wondering about timing of mulching them for winter. It still has not frosted where I am (Somerville, MA), and the plants look green and healthy. I have a bunch of salt marsh hay I am planning to put over them for winter, but should I wait until the plants die back? Or until the ground freezes? Should I put down some compost first? These are June bearing, so I’m planning on doing your bed renovation after harvest next year, including applying compost and straw mulch. Sorry for the belated reply. Mulch strawberries after the ground freezes about an inch deep, typically late in December. Yes, put compost down first if you’re going to put down compost.